On the eve of Pope Francis' visit to New York, I waited on the corner of Fifth Avenue -- a mere 50 yards from where he would soon be sleeping. It was the start of Yom Kippur. The corner of 72nd Street is the second to last stop on the uptown route of the Coalition for the Homeless mobile food van, dispensing free meals to anyone who shows up. It was almost 9 p.m., a quiet time in this toney neighborhood and I didn't see a soul waiting. The van pulled up and out of the shadows came a dozen men - gradually and silently. The exchange was a familiar greeting and description of the meal; turkey stew, an orange and milk. Meal in hand, the men slipped back into the darkness. In recent weeks there has been much discussion about the homeless population, mostly speculation about how once again, they seem to be everywhere. As the headlines turned to shelters and policy, I began to wonder what and where this itinerant population ate. What I have subsequently learned about homelessness, hunger, soup kitchens, shelters and many of the NFP organizations tasked with providing services, could fill pages. Embedded in the controversy is both a tribute to and condemnation of our social and political system and a deep a complex problem that defies any quick or simple solution. The homeless, though a most visible manifestation of the hungry, are a fraction of the demographic lacking access or ability to feed themselves on a daily basis. (Food insecure is the term.) Joel Berg, the tireless advocate for the hungry, shared statistics: In New York, the average current shelter population is about 57,000; chronic street homeless, a few thousand; and food insecure at 1.4 million. Thus the realization that our attention is focused on the tip, while we remain ignorant or oblivious to the iceberg below it. Where do the homeless find shelter and food? To begin with, there are subsets: Families with young children or with adult children, singles, victims of domestic violence, mentally ill, physically disabled, and veterans. The majority are sheltered in a range of sites; most managed by private/non-profit agencies and few by the city. Some sites are simply beds and varying levels of social services, while many offer longer stays and focus on helping individuals recover their lives. Families with young children are most often housed in temporary apartment units with kitchen access. 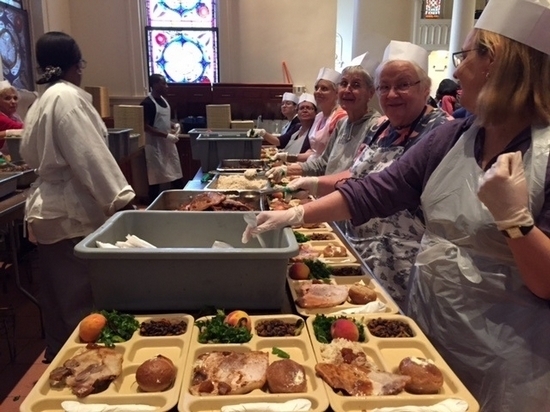 Within the patchwork of bed-only shelters, most homeless are expected to arrive at night having eaten, and are offered simple fare like peanut butter sandwiches or items dropped off by congregants. A pediatrician at Columbia Presbyterian Hospital who does community outreach to East Harlem and South Bronx families, described food in shelter housing kitchens as a can of spaghetti, convenience food or reheated frozen meals. Homeless families are eligible for SNAP (food stamp) benefits, which means they can shop but the environment is not conducive to home cooked nutritious meal. Over 80 percent of homeless children go to schools with access to free lunch and sometimes breakfast. These families, the doctor said, are stressed and though sheltered, in extreme poverty, with few prospects. Soup kitchens are a major source of meals. I visited Mike Ottley, director of operations for Holy Apostles on 28th Street and Ninth Avenue where 1,200 lunchtime meals have been served daily for more than 33 years. Mike is a Culinary Institute of America graduate, overseeing meals at Holy Apostles since 2009 after a traditional culinary career in hospitality. That passion stays with him. The kale salad on the lunch tray is part of his commitment to serve fresh vegetables and comes from the local farmer's market around the corner at end-of-day, greatly reduced prices. There were local peaches for dessert. Five hundred pounds of bread is served daily, although most keep it with them for later. His food budget comes from the Hunger Prevention and Nutrition Assistance Program administered by the state) and block grants but over 80 percent comes from donors. He receives food from City Harvest as well as purchasing from wholesalers. "I'm a shopper," he says, looking at bid sheets from vendors very critically. Yet the menu, which changes daily, will surprise you. Voted best free meal on Yelp was a distinction he succeeded in squelching. By the way, most of the kale salad wasn't touched. Rice and beans, cooked collards, potatoes do much better, but Mike isn't discouraged. St. Francis Food Pantries and Shelters serves 1.5 million meals annually in their 40 pantry locations. Joe Sano, executive director, sees both the homeless and the working poor daily. On his grocery list are cases of ravioli, beef stew, chili beans, tuna, corned beef, cereal, mac-n-cheese, oatmeal, spaghetti, rice and fresh produce. The fruits and vegetables comes as a donation from Gristedes. No cookies, no candy, no sugary drinks. He sees more working poor as well as an increase in Asian faces and the elderly, all a result of gentrification pressures. The Salvation Army services 2.5 million meals to the city's homeless and working poor each year in 32 locations where the ratios of homeless to working poor vary. With increased emphasis on healthier meals, many guests resist the fresh vegetables, whole fruit or grains, said Joe Phillips, director of emergency programs. On the list of banned foods: Sausage, whole milk, bottled water, high sodium items, fruit roll ups, pudding, doughnuts, chips and obvious junk food. Overall, he said, an increase in demand for meals had been matched by a decrease in funding. Delving into this topic was fed by my curiosity but also a sense of the connection between social justice and food. We think of 'the homeless' as an anonymous monolith and very apart from mainstream life, but when we look at mealtime and the necessity of eating, suddenly, they are just like us.